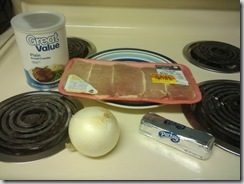 You are here: Home / Recipes / Dinner / Pork Chops and Onions! So, I don’t really cook much, but, I wanted to offer y’all some frugal and delicious recipes, so I asked my friend Susan to guest post each week with a recipe – she’s a GREAT cook! So, then Tamona at Tamona’s Tips shamed me into sharing a few recipes myself – so here is the first one! 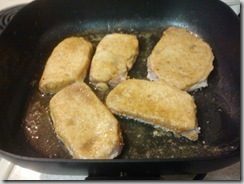 My hubby found some nice chops on sale and grabbed them while he was out, so I decided I would make this recipe and share it with you. So, this is very simple and quick. My hubby and I LOVE onions, and the kids like the recipe, too. They don’t have to eat the onions! Heat the oven to 350 degrees and turn on a skillet with a couple of pats of butter. Then, slice the onions in rings, it doesn’t really matter how you slice them, I guess, I just have always done them in rings. Place them in the heated skillet with the butter. Let those sauté a bit, not real soft, they will keep cooking in the oven. 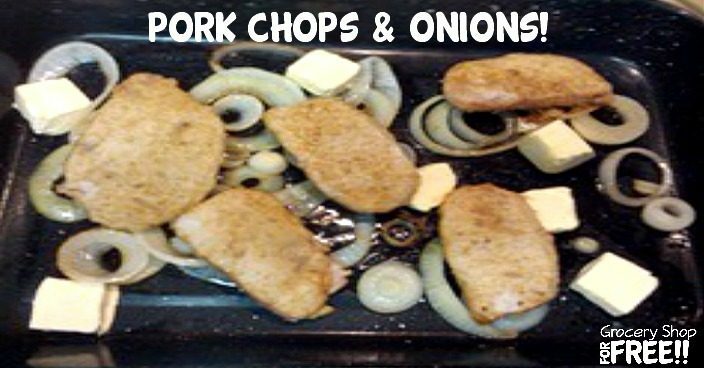 Once your onions are a little soft, transfer them to a baking dish large enough for your pork chops. Once they are in the baking dish, add a few pats of butter to the baking dish. Let sit while you move on to the pork chops. 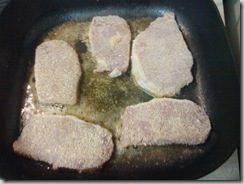 Add a little more butter to your skillet and lightly roll your pork chops in bread crumbs or flour. 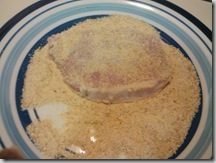 I had never used bread crumbs before, but I did this time and they were good! So, like I said keep it light – we just want a dusting – we’re not looking for crunchy here. turn them and let them do the same on the other side. 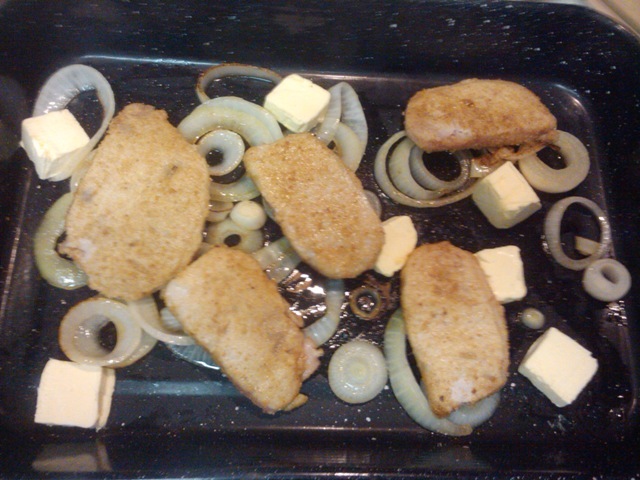 Once they are just lightly browned move them to the baking dish with the onions. Place them in the oven for 25 minutes and you’re done! I sadly forgot to take after pics. So, you will have to imagine what they looked like after they were done – but I can tell you – they were very good! I LOVE doing them this way! The whole thing takes just a few minutes and you’re done! So, hopefully you can try them and enjoy them – I know it’s basic – but I guess I am just a basic kinda girl! OMG you cooked something with butter! Here I was afraid that you were gonna make something I would never try lol! Life is so much better with butter isn’t it! These pork chops look scrum-d-ly-umptious! Now that you made that applesauce comment, I am thinking some baked apples would be awesome with these chops. Oh and where is your linky? @Tamona: Yeah I forgot the linky – but, it’s up now! Baked or fired apples would be great with these! Oh I remember this, this was the best recipe that you cooked! I am so hungry for it right now & I have not had Breakfast, yet!!! What? You cooked? I am so impressed! It looks awesome too. Are those pats of butter in the last page? Yummy looking pork. 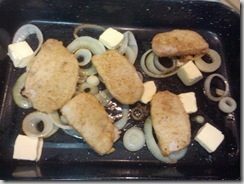 @Susan Merritt: Yes, before they went into the oven – forgot to take “afters”!